How to enter the livestream? 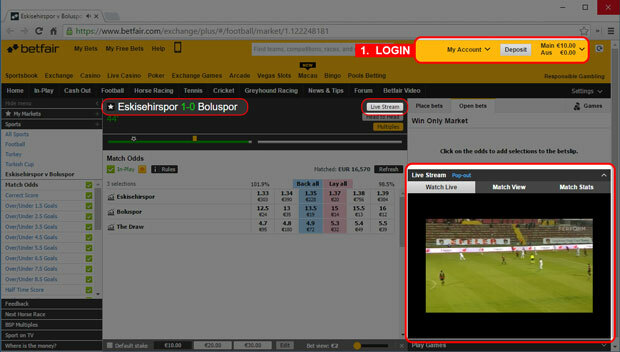 Open the match page on Betfair and the "Live Stream" player will show on the right side. Press play! Use the information from our Academy to find out which matches have Betfair Live Video available. The Betfair broadcasts are well known for being fast and having low delays, ideal for betting. Warning: The BettingAcademy.com together with Betfair provides the aggregated information of sports events with livestream coverage, with quick links so that you can access directly the match livestreaming page on Betfair. The intellectual property right announced here are country related, depending on where you are accessing the Betfair website from, you may not be able to watch the video. Now, you are seeing the full list of events to watch from .